This duvet cover is made from a 300 thread count organic cotton sateen fabric. Natural ivory color. Matches Sleep and Beyond Organic Sheets. Simple but gorgeous sateen duvet cover is made with a 300 thread count organic cotton sateen. 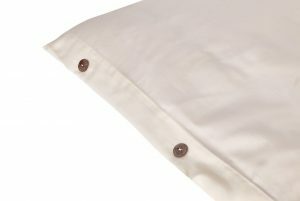 Duvet covers are constructed with the opening at the bottom. The button closure is sewn on a placket which folds to the inside so that it is not visible. Closes with coconut shell buttons. 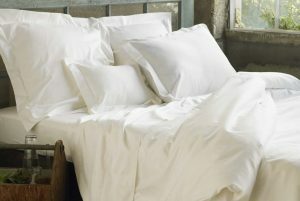 $168.00 – $238.00 Lustrous, organic cotton in 300 thread count sateen. Soft and comfortable cloud brushed flannel duvet cover. 6 oz. weight. Duvet covers are constructed with the opening at the bottom. The button closure is sewn on a placket which folds to the inside so that it is not visible. $198.00 – $298.00 Thick, 100% organic cotton cloud brushed flannel duvet cover. Beautiful birch duvet cover is made with an organic cotton and linen blend that gets softer with each wash. Duvet covers are constructed with the opening at the bottom. The button closure is sewn on a placket which folds to the inside so that it is not visible. Closes with coconut shell buttons. $348.00 – $398.00 Stylish cotton and linen blend duvet cover. 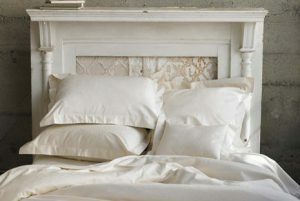 $48.00 – $68.00 Lustrous, organic cotton sateen. Our birch line is made from a blend of organic cotton and linen. Shams have a two inch flange. Matches our birch duvet covers. Pillow shams are available in Standard (20″ x 26″), King (20″ x 36″) and Euro (26″ x 26″) sizes. All are envelope style cases with openings at the back with a six inch overlap. Shams come in a package of one. 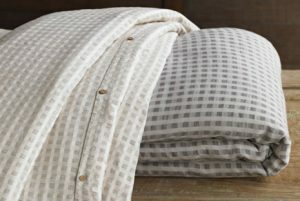 $68.00 – $88.00 Stylish cotton and linen blend sham. Duvet covers and shams provide style and flair to a bedroom. Made with chemical-free organic cotton in a variety of weaves and thread counts, duvets and shams protect your comforter and decorative pillows while creating luxury that is also healthy.